Andy Gibney is a unique fellow. He’s a martial artist, entrepreneur and public speaker. And if that’s not enough he’s the worlds only business Jedi. His perspective on life and the world of martial arts is coloured by many diverse areas of study and training. Witty, erudite and he draws on a wealth of experience and his life story takes in adversity and heartache as a child and success on the World stage. 1981 he undertook the first stages in his physical training, beginning with Karate. 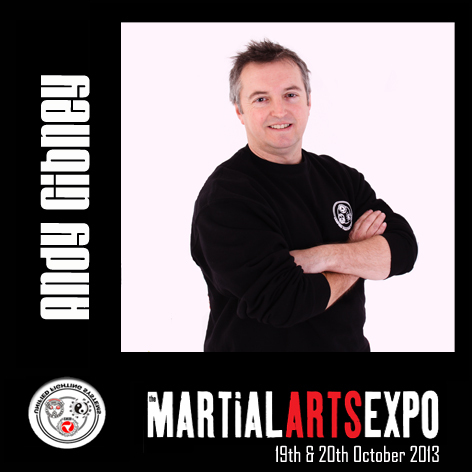 In 1987 he started his journey in Jeet Kune Do – he is now one of the most respected teachers of this system in the UK. For 6 years in the 1990’s he competed in the sport of stick-fighting winning 2 world championship silver medals and became British champion. In 2001 he was the world championship winning coach of the British Team. He has also been inducted into the Hall of Fame in the US and the Philippines (the home of stick-fighting). Here the story takes a twist. After training the body for so long Andy went in search of psychology to improve his performance in all avenues. He trained with the best: Bandler, McKenna and Robbins as well as many others. He learned how to tell if a person is lying, he learned about the subconscious, body language and how to cure any phobia in under an hour. The chat with him at TMAX is surreal at times and honest and his story offers insight to all looking to be successful and happy in whatever walk of life you wish to choose.